Charles Dickens was the master of using coincidence as a literary device to portray social horrors. Oliver Twist condemned to the workhouse by greedy guardians, Sydney Carton making up for his wasted life by volunteering for a guillotine manned by angry French peasants, Little Dorritt in debtors’ prison. The best use of Dickens’ device, coincidence, was in A Handful of Dust in which a heartbroken jungle adventurer is imprisoned by a native tribe and condemned to read Little Dorrit to the chief for the rest of his life. In all of these and in most great literature, all comes out in the end, usually as unexpected consequences and not always as hoped for. Could a story have a more unintended consequence than for the courage of our parents and our grandparents in finding the will and way to survive their harsh lives in World War II to become the legacy of our having 18 ½ % APR credit cards to buy flat screen televisions to watch when we get home to eat fast food rather than cook? Is it a coincidence, and how will it end? I wrote French Letters, both Virginia’s War and Engaged in War, because I believe that our parents and grandparents found the courage to fight and survive World War II, on battlefield and home front, not so that six decades later we would spend our way to staggering household credit debt to buy cell phones and five day cruises but because they thought life could go back to the way it had been. They believed that with the destruction of the Axis they could resume growing up with their cousins, living in small home towns with Sunday dinners and rocking on the verandah, picking a husband or wife and sticking with it. It was not to be. Drugs, divorce, moving far from home in search of a job, and easy credit are just a few of the derailments on the road to riches triggered by the restlessness of the war generation. True, not all the changes are bad – widespread university education, racial and gender equality, science, all these and more have their seeds in that war. Nowhere, however, does our parents’ bequest seem to have had a more unexpected destiny than the phenomenal development of medicine and medical care. 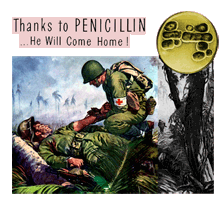 Penicillin, surgery, and radiology in all their forms have delivered us from millennia of death in childbirth and childhood, death from illness and infection, and enabled care for conditions that could never before be diagnosed or treated. Thanks to the urgency of that war’s medical horrors, we now live and expect to live well past the age of 80 or even 90. And therein the problem – with so few people dying now, thanks to the wartime discoveries that became medical advances, the planet’s overflow population turns back to war for solutions to overcrowding.